At the entrance to the exhibition at the Postpalast in Munich, there is a white book that carries the printed words: "Forgot your password?" Created by the German artist Aram Bartholl, who has been appropriating digital culture since the beginning of the 2000s, the piece is presented by Wolf Lieser of the DAM Gallery in Berlin. 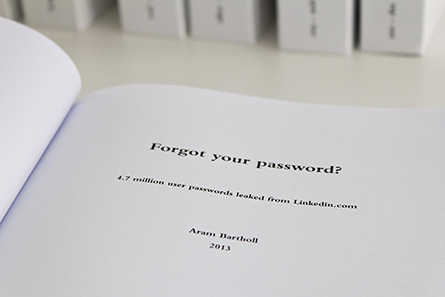 It is comprised of eight volumes that reveal 4.7 million of the 6,458,020 passwords that a group of Russian hackers supposedly extracted from the LinkedIn servers in 2012. While a significant part of this trophy having ended up on the Web, Aram Bartholl made use of it to print the access codes that the public can similarly scrutinize by asking another question: "Has my secret been revealed?" The work perfectly symbolizes the post-digital era in which we have entered, where the digital is everywhere, including in inanimate objects and access to the core of the art market, which is a necessary step in the recognition of the digital medium in contemporary art. Gone are the hopeless debates on the sustainability of variable media works. They are there, in galleries, and with collectors who are perhaps also refining their LinkedIn profiles. 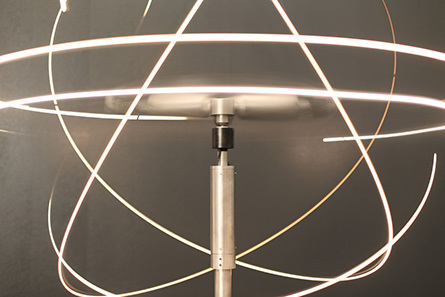 Nicolas Wierinck, founder of Cimatics Brussels, decided to devote a solo show to Frederik de Wilde. We recall this Belgian artist who claims to have created the "blackest black in the world" following his return from a residency spent at Rice University in Houston, known for its research in nanotechnology. The small square with a black composed of carbon nanotubes absorbing everything, particularly light, was renamed Hostage in 2010. The piece allows a radical gesture similar to that of Yves Klein protecting his International Klein Blue, in 1960. But already in 2010, Frederik de Wilde had planned to produce sculptures partially or totally covered by his precise black. 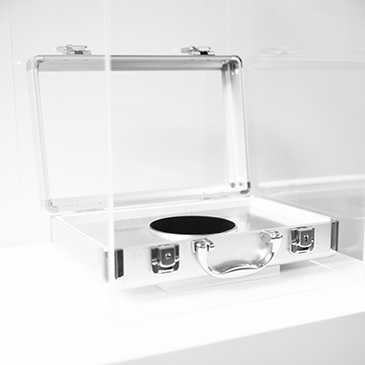 This has now been achieved – in a suitcase entitled NASABlck - Crcl # 1, which is on view in Munich, it seems literally riddled with holes in the central part because of the presence of the disk of carbon nanotubes on the surface. This object refers to Box in a Suitcase by Marcel Duchamp, in that it represents the history of this concept, without omitting the readymade component inherent in the color and form the artist appropriates. Duchamp would also remind us that we notice the presence of a readymade rather than contemplating it, as we note the apparent lack of matter where a no-glare black covers NASABlck - Crcl # 1. The works of Christa Sommerer, Laurent Mignonneau, and Jacques Perconte share the space of the Charlot Gallery, directed by Valerie Hasson-Benillouche. There, we find a generative video by Jacques Perconte who previously filmed a sequence that was shot before being treated with extreme precision by compression algorithms. 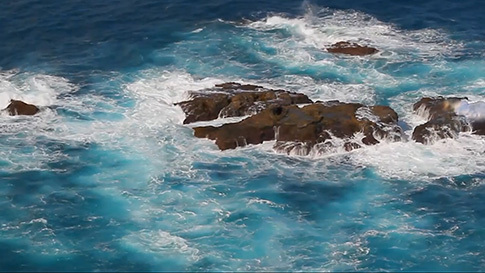 "In the northeast of the island of Madeira, from the top of the cliffs, you can see a rock about a hundred meters from the coast, lapped by the waves [...] The ocean never ceases to renew her salty caresses," a voice says, while all the particles of the image are renewed without ever repeating. The French artist envisages his filmic landscapes in a resolutely pictorial manner. Of the applications with which he experiments, he retains only the approximations. Everything seems controlled to the viewer, even though nothing was really planned. Before an exhibition, Perconte will often modify his "settings," so as to better adapt to the context, thus protecting the spectator from any form of repetition. The structure of the even caresses lavished upon the Madeira rock by the waves, renews even further. Philippe Riss, of XPO, also made the trip from Paris to support his artists, among whom, the American Addie Wagenknecht who has just joined his gallery. 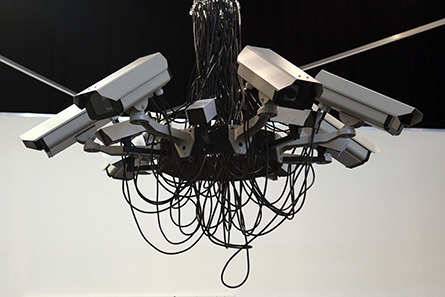 A chandelier hangs above our heads, drawing our attention because CCTV cameras have replaced bulbs or candles. This work, created in duplicate with the artist's proof, entitled Asymmetric Love, is similar in all respects to those that have been acquired by two collectors during the first digital art sale held last October at Phillips, New York. It is also interesting to note that this work perfectly crystallizes the strange relationship art has to power. The chandeliers of our institutions perfectly symbolize power, which the artist denounces through the use of cameras watching us. Add to this that this sculpture of the digital age and of networks evoking Nam June Paik's assemblages of TVs from the 60s, is presented to us in an art market context where the collection is also the artistic expression of soft power. This work by Addie Wagenknecht, beyond its obvious plasticity, is more complex than it seems. Frédéric Arnal, who directs the Louise Alexander Gallery between Paris and Sardinia, assembled various pieces by Laurent Bolognini, Miguel Chevalier, Pascal Haudressy, Sabine Pigalle, and Jay Shinn. Laurent Bolognini studied photography in order to finally work light paired engines – his research in continuity with the kinetic and light practices that emerged in the early sixties. His works, though often resembling one another, are in fact very different. We sometimes see in them the representation of small particles, and at others, the evocation of distant stars. Assisted by the extreme speed of the engines, they are designs that are imprinted on our retinas. Laurent Bolognini's performances emerge from the invisible by drawing on the limit of our vision, and on its relative imperfection. The convolutions of light are as smooth as the light of electrons, or the moon. These are indeed small laboratory experiments that the artist creates in the spaces of galleries and museums, in the realm between art and science. Of the two pieces of the same series by Pascal Haudressy, one revisits the history of art, evoking Saint Francis in Meditation – the other, representing a beating heart, borrowing instead from more aesthetics of contemporary medical imaging. Saint Francis is a fixed piece, but is also animated by tiny vibrations, just as the heart of Somewhere we will Meet Again, is put in motion by the instability by the myriads of line segments that make up the contours. There is a strong unity of style between the two images – one summoning art, and the other science. The vibrations perfectly figure the inherent energy contained in all forms of life, as ephemeral as they are. Which brings us back to the original topic of Saint Francis, holding in his right hand the head symbolizing our vanity. By using micro movements, the artist portrays the vanity in what could be likened to artistic visualization of corporal data. Bitform, directed by Steven Sacks, has a series in progress on view in a solo exhibition of Quayola, which pays tribute to the non-finito style of Michelangelo. 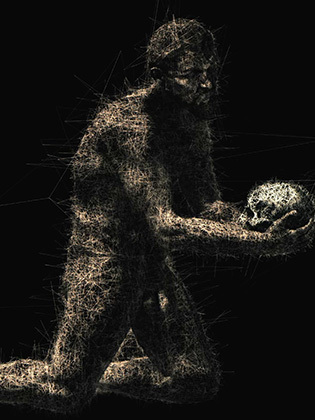 The three-dimensional models of the "slaves" in the image are revealed through the fluctuations of a marble made fluid with algorithms. Video documentation gives us a glimpse of the work of the industrial robot freeing the prisoners from their polystyrene blocks. And Quayola, quoting the master: In every block of marble I see a statue as plain as though it stood before me, shaped, and perfect in attitude and action. I have only to hew away the rough walls that imprison the lovely apparition to reveal it to the other eyes as mine see it." Michelangelo (1501). The Italian artist, living and working in London, "informs" the machine to "hue away the rough walls," teaching his mechanical arm the countless folds required to create the piece. 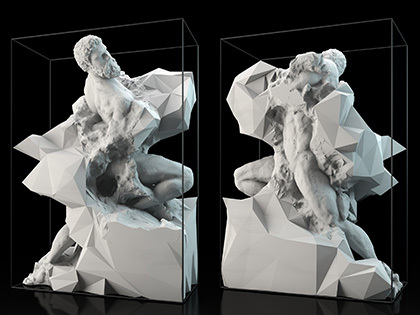 The accuracy of the arm of the machine is comparable to that of the hand of Michelangelo, while the aesthetics of the preserved polygons betray Quayola's use of digital technologies, with which he revisits art history. Leaving the Postpalast to go to the Lenbachhaus Museum, there is a Gerhard Richter exhibition on view. On the stairway, a work from the Strip series draws our gaze, seeking precision. The horizontal lines that compose it could extend to infinity. Approaching it means discovering others. But one would have to have kept the vision of a child and the patience gained by adults to observe them all, without forgetting that this series now has nearly 80 works. These are digital prints all from the same painting dating from 1990: Abstraktes Bild (724-4). The German artist, whose great diversity of styles is well known, divided the same painting vertically over and over again, until all he got were bands of pixels that he then stretched. 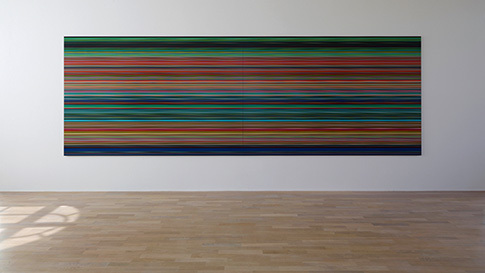 Richter does not hesitate taking advantage of digital technologies to further in his experiments, which are located precisely between the pictorial and the photographic. The presence of one of the most highly influential contemporary artists operating in digital media can only encourage initiatives like that of Annette Doms, the founder of Unpainted, the first media art fair in Germany. Written by Dominique Moulon for MCD and translated by Geoffrey Finch, January 2014.